There are numerous parks in Chicago, which helps to alleviate some of the hustle that is associated with city life. The Chicago Park District has a sizable annual budget to work with, and this sister agency of the city does well to keep no fewer than 552 parks in good order. Chicago boasts more parkland than any other city in the country, and a number of the parks here figure among the city's top tourist attractions. The completion of Millennium Park in recent years has certainly stirred up plenty of excitement and attracted curious visitors. The parks in Chicago are arguably best enjoyed in the summertime, but even during the cold winter months, they can provide a good place to stroll and take in the city. Some of the Chicago parks lie along the shoreline of Lake Michigan, as is the case with Lincoln Park, for example, and nine lakefront harbors are scattered among these coastal parks. As such, the Chicago Park District operates the largest municipal harbor system in the United States. In addition to nine harbors, the Chicago parks are also collectively home to 33 beaches, 16 lagoons, nine museums, and an array of bird and wildlife gardens. Some of the parks even have their own golf courses, which is good news for golf enthusiasts. Two of the more notable Chicago Park District golf courses include the 9-hole Sydney Marovitz course in Lincoln Park and the 18-hole Jackson Park Golf Course. Lincoln Park is the largest of the Chicago parks, and it also sees the most annual visitors. 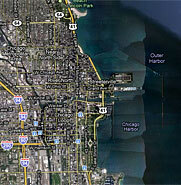 Found on the North Side, Lincoln Park lines the Lake Michigan coastline from North Avenue up to Ardmore. Numerous recreational facilities are available to Lincoln Park visitors, and in addition to a fantastic 9-hole golf course, they include baseball areas, tennis courts, basketball courts, and more than one harbor with boating facilities. The concrete path that winds through the park is excellent for walking, jogging, bicycling, and rollerblading, and many North Side Chicago residents take advantage of it when the weather is nice. Also among the highlights in Lincoln Park is the wonderful Lincoln Park Zoo, which is free to the public. Lincoln Park covers 1,200 acres, so there's plenty of room to stretch out if you're heading there to relax. Two of the other more notable Chicago Parks include Millennium Park and Grant Park. Millennium Park is one of the newer Chicago Parks, and it has gotten quite a lot of attention since it opened in 2004. This city park is spread out over 24.5 acres and begins just north of the renowned Art Institute of Chicago and Grant Park. As for Grant Park, it has been a Chicago favorite for years, as it is home to some of the city's top festivals. These festivals include the Taste of Chicago food festival, the Chicago Blues Festival, the Chicago Jazz Festival, and the Lollapalooza Music Festival. Grant Park is also home to Buckingham Fountain, which is a beautiful landmark fountain that was modeled after the Latona Fountain at the Palace of Versailles. On the southern end of Grant Park, Chicago's renowned Museum Campus can be found. Three of the best Chicago museums are here: the Field Museum of Natural History, the Adler Planetarium, and the Shedd Aquarium. When visiting the Museum Campus, you'll enjoy fantastic views of the Chicago skyline, which only enhances the experience. Back over in Millennium Park, highlights include the Cloud Gate sculpture, the Crowne Fountain, and the Jay Pritzker Pavilion. Cloud Gate is a large, silver sculpture that is nicknamed The Bean due to its bean-like shape. The Crowne Fountain is a favorite with the kids, as it features fantastic fountains positioned between two large screens displaying digital videos of everyday Chicagoans. As for the Jay Pritzker Pavilion, it is the park's Frank Gehry-designed outdoor performing arts venue. Lincoln Park, Grant Park, and Millennium Park are arguably the three leading parks in Chicago, but that doesn't mean that you shouldn't visit some of the others during your Chicago vacation. Jackson Park and Washington Park offer South Side residents and visitors plenty of room for recreation, and you'll do well to give them a look when in the area. The Chicago parks are among the city's best assets, so don't forget to add some park time to the agenda on your next visit.